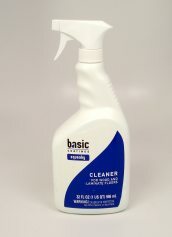 Basic Coatings Squeaky Cleaner for Wood and Laminate Floors is tough on dirt, gentle on floors and cleans without leaving a residue. Squeaky Cleaner is an excellent commercial-grade cleaner for all woods and laminate floors. 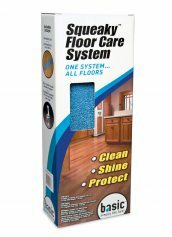 The Squeaky Floor Care system is designed for daily cleaning of wood, laminate, and other hard surface floors. The Floor Care System includes one Microfiber Cleaning Pad, a 32oz Squeaky Hardwood Floor Cleaner Spray Bottle, and a Swivel Head Mop with Pole. 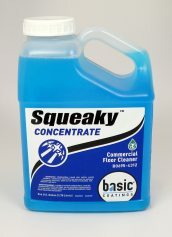 Squeaky Concentrate Commercial Floor Cleaner is tough on dirt, gentle on floors and cleans without leaving a residue. 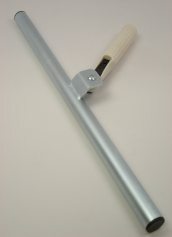 Squeaky is an excellent commercial grade cleaner for all woods and laminate floors. Gallon Concentrate. Squeaky Cleaner Spray for Wood and Laminate Floors is the original hardwood floor cleaner now offered in a convenient trigger spray bottle. Squeaky floor cleaner is designed for daily cleaning of and hard surface flooring. 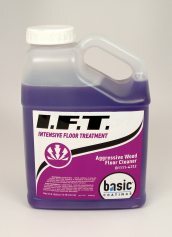 I.F.T., Or Intensive Floor Treatment is an aggressive cleaner that will easily remove ground in dirt, body oils, shoe marks, ball scuffs, spilled beverages, etc. I.F.T. 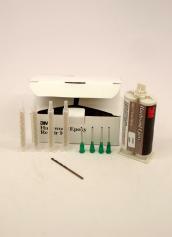 is the first step in a two-part cleaning process to prepare floors for the TyKote Dustfree Refinishing System. One Gallon. Basic Coatings Squeaky Cleaner for Wood and Laminate Floors is tough on dirt, gentle on floors and cleans without leaving a residue. Squeaky Cleaner is an excellent commercial-grade cleaner for all woods and laminate floors. Squeaky is also a pre-cleaner during the finish or recoating process, and it's the second step in the two-part cleaning process for the TyKote Dustfree Refinishing System.